As the mother of Wes Moore, author of a bestselling memoir about overcoming the obstacles that face a fatherless young black man, Joy Thomas Moore is constantly asked: How did you do it? How can you be a good parent, have a career and stay healthy when you don't have a partner to pick up the slack? How do you connect with a child when you can't always be there? Joy's answer is "presence." The presence of mind, heart, faith, courage, resources, connectedness and values -- seven impactful ways of being a force in a child's life, ensuring that they feel your influence. We can't always be physically there for our children, but the power of presence can help us be that voice in the back of their minds that reminds and guides them through challenging times. In The Power of Presence, Moore shares compelling stories from women who have been there, plus practical advice on everything from savings accounts to mindfulness. Her book is a compassionate look at what it takes to raise great kids even in less than ideal circumstances. 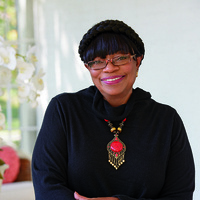 Joy Thomas Moore is a Peabody Award winner and President and CEO of JWS Media Consulting. She worked for 15 years with the Annie E. Casey Foundation. Kai Jackson of FOX45 will moderate the conversation with Joy Thomas Moore and Shani A. Moore Weatherby. Shani A. Moore Weatherby is a lawyer, writer, and first-generation American. Shani is Head of Cinema & Marketing Legal Affairs at Dolby. She's also an award-winning TV writer whose scripts have garnered recognition in international screenwriting competitions. MahoganyBooks will have copies of the book for sale at a book signing following the program.